Located In: City of Red Wing, Goodhue County. 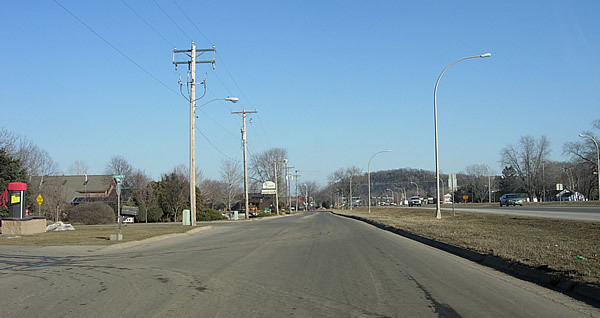 Portions of the northbound service drive near Tyler Road were once part of the original concrete road out of the west side of Red Wing. The service drive was originally paved with 18 feet of concrete in 1920 as part of the construction of a highway stretching westward from downtown Red Wing to what is now the junction with Highway 19 on the west end of town. This paving was the beginning of the construction of the first modern paved highway between La Crescent and St. Paul. The original highway near Tyler Road was bypassed in 1952 by the construction of the modern four-lane divided highway (which incidentally ended just to the west of the service drive at Carol Lane - the divided highway wasn't extended west up the hill until the early 1980's). Plans show that the old concrete was left intact from a point just west of Sargent Drive to Red Wing Avenue, at which point it was connected to a new roadway that led to another portion of the old highway on what is now Old West Main Street. Plans show that the area around Tyler Road was still being cultivated as farmland in the early 1950's. The landscape in the area has since changed dramatically. It has become one of Red Wing's busiest retail districts, featuring many big-box retailers, including Target. Further development in the area has resulted in the modernization of the service drive. The road has been repaved, and realigned heavily at Tyler Road to move the intersection away from U.S. 61, removing a large portion of the old highway. A bank's parking lot now occupies part of the alignment of the old road. Photo Tour - Photos were taken in March, 2007. Looking southeast on the north service road at Sargent Drive. The old highway ran through what is now part of the driveway for a bank. Looking southeast on the north service drive, east of Tyler Road. Note the chain restaurants. 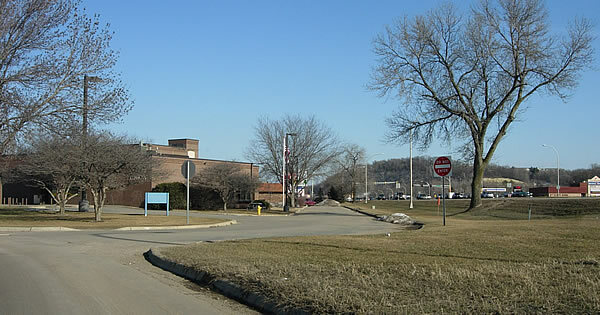 Looking east at Red Wing Avenue. The curve ahead marks the end of the old alignment.